The manual coffee grinder features a convenient removable hand crank mechanism consistently eliminates over 90% of the noise that electric grinders produce, go ahead and grind your coffee without waking the kids or distracting your coworkers. With over 18 built-in click settings, you can use your grinder for everything such as espresso, pour over, french press/plunger, percolator or Turkish etc. And for cleaning, simply use a brush or a rag to wash the grinder, NEVER do it with bare hands to avoid injury. No batteries, cords, or power, this manual coffee grinder allows you to enjoy your freshly ground coffee beans indoors, outdoors, and anywhere you want. A good grinding tool for coffee bean in the kitchen, ideal gadget to make freshly coffee bean powder for enjoying tasty coffee. Easily store it inside your handbags or take it apart to save space in your carry on. If you are looking for the a gift for your friend or family member that loves coffee, this Manual Coffee Grinder is your one-of-a-kind, unforgettable present. Whether it's for a wedding, house-warming, Birthday, Christmas or Valentine's Day you can share it with confidence. PORTABLE & COMPACT - This manual coffee grinder is unique triangle design, non-slip, you can use it immediately without much instruction and a quick wipe after usage, allowing you to travel with and brew freshly roasted ground coffee beans on your next camping, hiking, backpacking, or outdoors trip. NO POWER NEEDED - No batteries, power, or long plastic cords needed to operate your portable compact coffee grinder, the efficient ceramic burrs allow you to manually grind your beans with ease while the aroma of fresh coffee wafts over you. DURABLE USE - The coffee bean grinder is built with top quality, rust & corrosion resistance stainless steel, and the built-in adjustable grind selector is with over 18 click settings to ensure 100% precision control over the coarseness of your ground coffee. ADJUSTABLE GRINDER - The ceramic conical burr allows you to adjust your coffee bean, adjust it clockwise for finer or counter-clockwise for coarser. The stainless hand crank is fixed onto the grinder lid with a nut, no worry about the hand crank falling off while grinding. 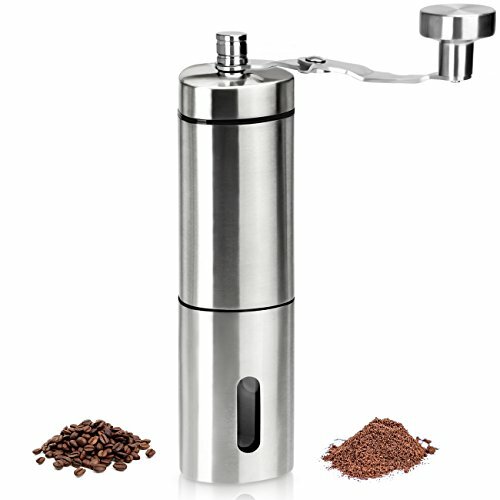 WHAT YOU GET - 1 x unique triangle manual coffee grinder, 1 x bonus carrying bag, 30 days money back guarantee and friendly customer service, if for any reason you don't satisfy with the coffee grinder, please feel free to contact us, replacement or refund would be sent under warranty. If you have any questions about this product by WENFENG, contact us by completing and submitting the form below. If you are looking for a specif part number, please include it with your message.